I finished! 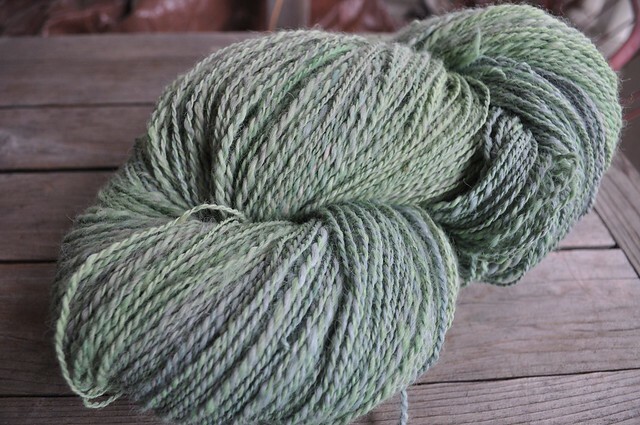 I finished spinning and plying the filthy alpaca. I've washed it several times and I still think it's fairly dirty but it's improving. 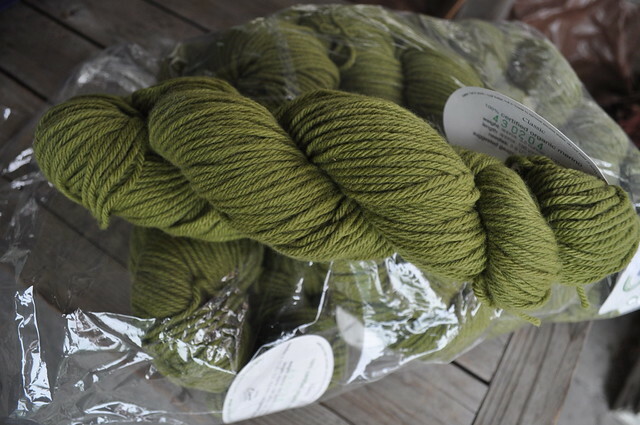 That's 660 yards of sport-ish weight alpaca. I also now seemed to be obsessed with sweaters. 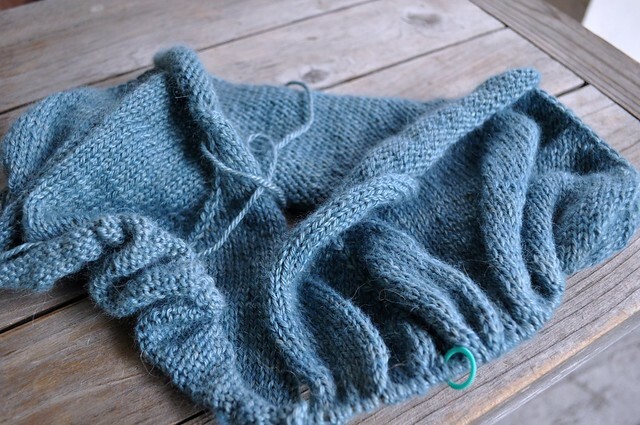 I've started Idylwylde with the Seattle Knitters Guild Hazel Knits colorway in Artisan Sock. I'm using Road to China Light and it is delicious. You know how you shop for yarn for a project and you find yourself thinking, "I could save $20 if I used this nice but fairly nondescript yarn." Well, I say, at least every once in a while, don't! This yarn is heavenly. It's soft, silky, fuzzy and lovely and the color is amazing. Treat yourself. You will be happy. I snapped up a few yarns at the Fiber Gallery's annual sale before they were discontinued and gone forever. 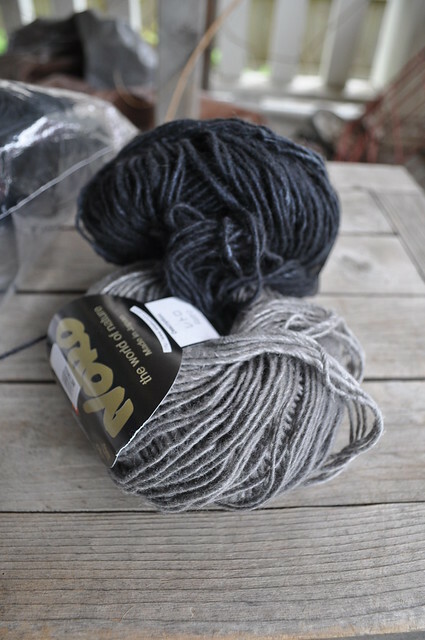 This is Noro Retro in two shades of grey. I have a plan for a stripey, top-down sweater. This is O-Wool Classic. It's still being made but this is the old put-up from Vermont Organics. It was a bargain and I've always wanted a sweater in it. And, you know, it's green. *We do this a lot. We did a casual KAL for Aidez. We've done them for sock patterns. It's a lot of fun to see what everyone does. 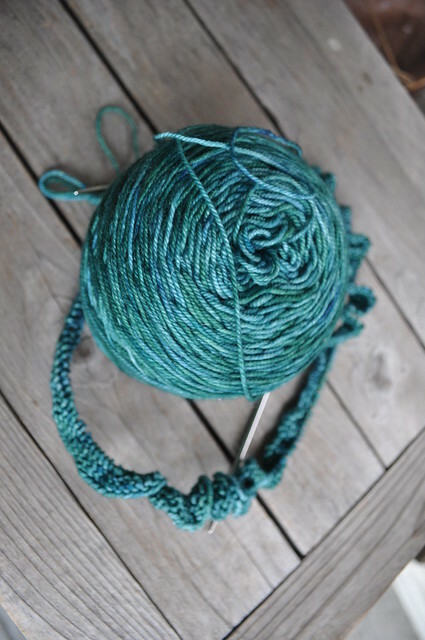 Love your yarn; it's very different from what I usually get and something I might consider. Beautiful spinning, too!